Use effective cold calling questions to qualify your sales appointments and close more sales as you only meet with prospects that can actually buy from you. Know which prospects to arrange meetings with by following the sales training on this page on how to Qualify sales appointments. Use set criteria with your cold call scripts to define who can buy from you, and who can’t. Save valuable selling time by only meeting with real potential customers. On your Sales Appointment call you’ve completed Stage 1, your Introduction Stage. You’ve used a one line Motivator in Stage 2 to move to this stage, stage 3, where you Qualify your prospect using effective cold calling questions. Your objective at this Qualifying Stage is to discover if the prospect you’re talking to could buy from you and is therefore worth your time meeting. Qualifying a prospect on a sales appointment call has nothing to do with whether or not they will buy from you. The objective is to Qualify the prospect as someone that can buy from you. As someone who could become a customer. By Qualifying prospects in this stage 3 of your appointment call you are only going to move to stage 4, where you gain agreement to a meeting, with people that can buy from you. By doing this you are only using your valuable selling time on sales appointments where you can close the sale. Now clearly define the criteria for prospects that are real potential customers. 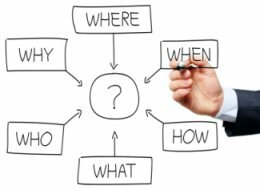 Before you can write you effective cold calling questions, to qualify prospects on your sales appointment calls, you will need to define the criteria that a prospect must meet to make them a potential customer. What does a prospect need to have in order to be able buy from you? Credit scores, financial criteria, or payment related information. Geographical location, residential situation, or access requirements. Personal details, age, health, nationality, employment, or family status. A specific need for a product or process, minimum order size. Number of people at address, or number of employees. Whatever the definite, must have, requirements are they need to be noted down on a list. Only list what a prospect has to have, not what it would be nice for them to have. Not having any single one of the criterion on your list should disqualify the prospect as a potential customer and you should end the call without agreeing an appointment. When you’ve created your list of qualifying criteria the next step is to create a list of effective cold call questions. If you have several questions on the same topic you can group them together. This makes for a more conversational style of asking, rather than reeling off lots of short closed questions demanding yes or no answers. Work on the wording for any questions that may be sensitive. For example questions on financial matters or family status. These may need phrasing tactfully. Now check that your list of questions are effective for your cold call script. Will they will give you all the information you need to qualify the prospects on your sales appointment calls as someone you want to meet with. Make this stage of the call as brief as possible. You only need to ask questions related to qualifying prospects as people you want to meet with. You don’t want to get dragged into a sales pitch on the phone, unless that benefits you. Once you’ve asked your sales appointment questions it should be easy to decide if the prospect qualifies as someone that you want to meet with. On this page the sales training focused on Stage 3 , adding effective cold calling questions to your sales appointment call. To see sales training on the next stage click the link for Stage 4 below, or choose one of the other stages of the call. Stage 1 - Create an attention grabbing Introduction Stage. Step by step instructions on creating your own effective sales appointment call scripts by following a set of simple exercises. Detailed training on all 4 stages of an appointment call. A full section on preventing and handling objections. Create your own, personalised, effective cold calling script. 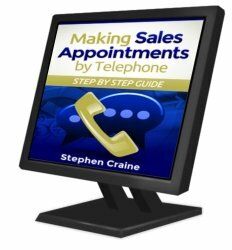 Practical sales training on the physiological aspects of successful appointment cold calling sessions. I use this course with the sales teams I train and manage so it's already proven successful by working professionals.